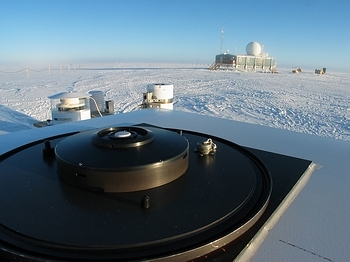 Figure 1: Installation of the UV monitoring system at Summit Greenland. The irradiance collector of a BSI SUV-150B spectroradiometer is shown in the foreground. Instruments in the background include a GUV-511 multi-filter instrument from BSI and a PSP pyranometer from Eppley Laboratory.In 1987, responding to serious ozone depletion reported in Antarctica, the Division of Polar Programs of the National Science Foundation called for the establishment of an ultraviolet (UV) monitoring system in Antarctica. Acting on short notice, Biospherical Instruments Inc. (BSI) was selected to install a network of instruments, which has become known as the NSF Office of Polar Programs Ultraviolet Spectral Irradiance Monitoring Network (UVSIMN). BSI has been responsible for overseeing the network's operation, data processing, quality control, and dissemination of data since 1988. Network locations include the South Pole; two research stations at the Antarctic coast (McMurdo and Palmer); the city of Ushuaia at the tip of South America; the Arctic village of Barrow; and Summit, a research camp established at the top of Greenland’s ice sheet (Figure 1). An additional instrument is located at our company’s headquarters in San Diego. The network has produced one of the longest Climate Data Records of UV radiation in existence. Data are distributed via the website uv.biospherical.com, which also provides extensive information on the network's instrumentation (BSI's SUV spectroradiometers and GUV multifilter radiometers), data processing, quality control, and data format. The organizational structure of the network changed in 2009. The network sites at Barrow and Summit became part of NSF's Arctic Observing Network (www.aoncadis.org). BSI continues operating the two sites. In 2010, NOAA's Global Monitoring Division took over the helm from the NSF to oversee operation of the instruments at the South Pole, McMurdo Station, and Palmer Station. BSI continues to prepare and quality-control data of the three sites. In addition to operating the network, BSI has added a strong research component to the project with a focus on atmospheric physics. Results have been presented at numerous conferences and were published in more than 60 papers (http://www.biospherical.com/nsf/references.asp), either independently or in collaboration with other researchers. Some of these results are summarized here. We established a climatology of the UV Index (a measure of sun-burning radiation) for all sites of the NSF UV Monitoring Network. Results were published in the book "UV Radiation in Global Climate Change: Measurements, Modeling and Effects on Ecosystems." Examples of these results for the South Pole and Barrow are shown in Figure 2. Figure 2: Climatology of noontime UV Index at South Pole and Barrow. Measurements from the years 1991-2007 are indicated by black dots. Statistic based on these measurements are indicated by thick lines. Reconstructions of historical UV Indices are indicated by thin lines and gray-shading. A 11-day running-average has been applied to the average, median, 10% and 90% lines. The plot starts at the winter solstice. Summer solstice, and vernal and autumnal equinoxes are indicated by broken lines. Measurements of the noontime UV Index covering all years of network operation are indicated by black dots. Associated statistics (average, median, 10th and 90th percentile, overall maximum) are drawn with thick lines. At the South Pole, there is a strong enhancement during the spring (October to November) because of the effect of the ozone hole. At Barrow, average UV Indices are more symmetrical about the summer solstice (broken vertical line), but the variability is much larger in summer than spring. This is a consequence of the annual cycles of snow cover, sea ice extent, and cloudiness. We also compared UV indices at the South Pole (representative for the polar plateau) and Summit (representative for Greenland’s interior) (Bernhard et al. 2008a). One important result was that the UV indices measured during the austral spring at the South Pole are 1.9–2.4 times larger than the UV indices during the vernal spring at Summit despite the similar locations of the two sites on vast, highly reflective, and high-altitude ice sheets. Measured values from the South Pole and Barrow were also compared with estimates of historical UV Indices (1963–1980 for the South Pole; 1973–1980 for Barrow), which were reconstructed from data of total ozone predating operations of the network. These estimates are indicated in Figure 2 by gray-shading. During October and November, the average UV Index measured at the South Pole between 1991 and 2006 was 55–85% larger than the estimate for the years 1963–1980. In contrast at Barrow, there was little change between the two periods: the gray-shaded area in Figure 2 has a similar pattern to that of recent measurements. The analysis provided valuable insight into the evolution of UV irradiance during the last 30 years. Figure 3. Effect of total ozone (a), albedo (b), aerosols (c), clouds (d) on the annual cycle of the UV Index at Barrow. Panel (e) compares the effects of all factors on a common scale and panel (f) quantifies the variability of the various factors. Figure is from Bernhard et al., .UV irradiance at the surface is affected by the solar elevation, total ozone, clouds, Rayleigh scattering, surface albedo (e.g., snow cover and sea ice extent), aerosols, absorption by trace gases, and Sun–Earth distance. In 2007, we published the most in-depth study to date to separate the effect of these factors (Bernhard et al. 2007). The analysis was based on our UV measurements at Barrow. Figure 3 summarizes some of the results. Panel a indicates the effect of the total ozone column on the annual cycle of the UV Index at Barrow. Data are normalized to the effect of ozone at the summer solstice. Data for individual years are indicated by small dots, and large red circles represent the climatology. Because of larger atmospheric ozone concentration in April, the UV Index is about 25% lower compared to the solstice, while lower ozone in September enhances the UV Index by about 20%. High albedo in spring, due to snow and sea ice cover, increases the UV Index by 40–55% compared to summer when albedo is very low (Panel b). The albedo in May and June was greatly affected by the date of snow melt and ranged between 0.2 and 0.8. Aided by sunphotometer measurements provided by NOAA, we showed that aerosols reduce the UV Index by typically 3–5%. Aerosol effects are largest during the spring because of “Arctic haze” episodes (Panel c). The effect of clouds is much larger during the summer and fall, partly because of the increased frequency of storms (Panel d). In addition, the effect of clouds is moderated during the spring because of multiple reflections between snow-covered ground and cloud ceiling. In Panel e, the effects of the four factors are drawn on a common scale. The spring-time reduction of the UV Index due to the annual ozone cycle is overcompensated by the effects of albedo and clouds, highlighting that measurements of ozone alone are not sufficient for understanding the Arctic UV climate. Our study suggested that long-term changes of albedo and clouds may have a profound effect on the Arctic UV climate. The importance of clouds is further highlighted in Panel f, indicating that the year-to-year variability in UV due to clouds, exceeds that of the other factors, particularly during summer and fall. Figure 4. Total ozone at Summit, South Pole and Barrow derived from measurements of the UV Monitoring Network Panel a shows total ozone as a function of time of year while Panel b shows the same data set as a function of solar zenith angle. There is a stark contrast between the annual cycles of total ozone at South Pole and the two northern-hemisphere sites: at South Pole, the lowest ozone columns are observed in the austral spring (October through early December), when Antarctica is affected by the ozone hole and total ozone is frequently below 220 DU. In contrast, total ozone at Barrow and Summit is largest during the boreal spring (February and April) as a result of the so-called Brewer-Dobson circulation.We developed a new method for calculating total ozone from global irradiance spectra measured by instruments of the NSF UV Monitoring Network (Bernhard et al. 2003). The method takes vertical profiles of ozone and temperature into account and delivers more accurate results at small solar elevations than previous approaches (Figure 3). Measurements of the UV network have also been used for the validation of total ozone observations performed by the instruments usually used for this purpose (Dobson and Brewer spectrophotometers). As part of this research, we discovered an error in the Dobson ozone absorption coefficients recommended by the World Meteorological Organisation (Bernhard et al. 2007a). Our results may help to improve the accuracy of measurements performed by WMO’s Global Atmospheric Watch program. Our data have also been used for the validation of surface UVR retrievals of the Ozone Monitoring Instrument (OMI) on NASA’s AURA satellite (Tanskanen et al. 2007b). One important result was that OMI underestimates erythemal UV doses at coastal high-latitude locations sometimes by up to 60%. The quality of data of the UV Monitoring Network has been regularly assessed by participation in intercomparisons. The SUV-150B spectroradiometer now installed at Summit participated in the fifth North American Interagency Intercomparison for UV Spectroradiometers, held at Boulder, Colo., in 2003 (Wuttke et al. 2006, and Lantz et al. 2008). The instrument at McMurdo was compared with a NIWA spectroradiometer, which was brought to Antarctica for a 2-month campaign (Bernhard et al. 2008b). The quality of the network’s UV data meets the standard of the Network for the Detection of Atmospheric Composition Change (NDACC), a global network focusing on high-quality long-term measurements of atmospheric constituents. We developed an extensive set of software tools for the quality control of spectral measurements, which includes the test and correction of measured spectra for wavelength shifts, the cosine error, outliers, responsivity drifts, detection limits, etc. (Bernhard et al. 2004). We also developed methods utilizing measurements of filter radiometers for the quality control of spectroradiometric data (Bernhard et al. 2005 and 2008a). These tools are routinely implemented for preparing and testing data of the NSF UV Monitoring Network. Bernhard, G., C.R. Booth, and R.D. McPeters. (2003). Calculation of total column ozone from global UV spectra at high latitudes. J. Geophys. Res., 108(D17), 4532, doi:10.1029/2003JD003450. Bernhard, G., C.R. Booth, and J.C. Ehramjian. (2004). Version 2 data of the National Science Foundation’s Ultraviolet Radiation Monitoring Network: South Pole, J. Geophys. Res., 109, D21207, doi:10.1029/2004JD004937. Bernhard, G., R.D. Evans, G.J. Labow, and S.J. Oltmans. (2005a). Bias in Dobson Total Ozone Measurements at High Latitudes due to Approximations in Calculations of Ozone Absorption Coefficients and Airmass. J. Geophys. Res., 110, D10305, doi:10.1029/2004JD005559. Bernhard, G., C.R. Booth, and J.C. Ehramjian. (2005b). Real-time ultraviolet and column ozone from multichannel ultraviolet radiometers deployed in the National Science Foundation’s ultraviolet monitoring network. Opt. Eng., 44(4), 041011-1 – 041011-12. Wuttke S., G. Seckmeyer, G. Bernhard, J. Ehramjian, R. McKenzie, P. Johnston, and M. O'Neil. (2006). New spectroradiometers complying with the NDSC standards, J. Atmos. Ocean. Tech., 23(2), 241–251. Bernhard, G., C.R. Booth, J.C. Ehramjian, R. Stone, and E.G. Dutton (2007a). Ultraviolet and visible radiation at Barrow, Alaska: Climatology and influencing factors on the basis of version 2 National Science Foundation network data, J. Geophys. Res., 112, D09101, doi:10.1029/2006JD007865. Tanskanen, A., A, Lindfors, A. Määttä, N. Krotkov, J. Herman, J. Kaurola, T. Koskela, K. Lakkala, V. Fioletov, G. Bernhard, R. McKenzie, Y. Kondo, M. O’Neill, H. Slaper, P. den Outer, A.F. Bais, and J. Tamminen. (2007b). Validation of daily erythemal doses from Ozone Monitoring Instrument with ground-based UV measurement data, J. Geophys. Res., 112, D24S44, doi:10.1029/2007JD008830. Bernhard, G., C.R. Booth, and J.C. Ehramjian. (2008a). Comparison of UV irradiance measurements at Summit, Greenland; Barrow, Alaska; and South Pole, Antarctica, Atmos. Chem. Phys., 8, 4799–4810. Bernhard, G., R.L. McKenzie, M. Kotkamp, S. Wood, C.R. Booth, J.C. Ehramjian, P. Johnston, and S.E. Nichol. (2008b). Comparison of ultraviolet spectroradiometers in Antarctica, J. Geophys. Res, 113, D14310, doi:10.1029/2007JD009489. Lantz, K., P. Disterhoft, J. Slusser, W. Gao, J. Berndt, G. Bernhard, S. Bloms, R. Booth, J. Ehramjian, L. Harrison, G. Janson, P. Johnston, P. Kiedron, R. McKenzie, M. Kimlin, J.P. Neale, M. O’Neill, V.V. Quang, G. Seckmeyer, T. Taylor, S. Wuttke, and J. Michalsky. (2008b). The 2003 North American interagency intercomparison of ultraviolet spectroradiometers: Scanning and spectrograph instruments, J. Appl. Remote Sens., 2, 023547, doi:10.1117/1.3040299.